LONDON -- This will be a hectic week for Jack Crawford. He has already played tour guide for some Dallas Cowboys teammates and staff. He is also something of a ticket broker. And he is also trying to play defensive end again. Born and raised in north London, Crawford can truly call this week’s game against the Jacksonville Jaguars a homecoming. 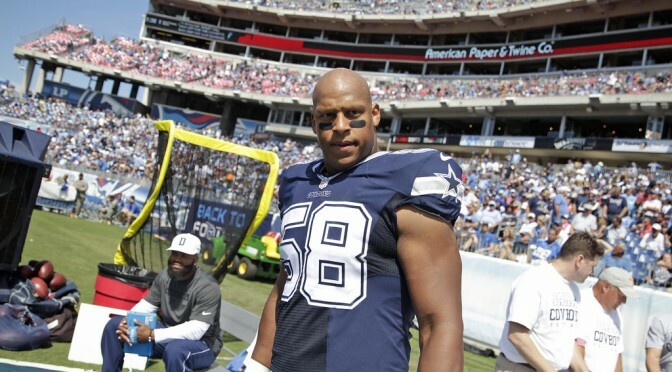 Cowboys DE Jack Crawford is the first NFL player to grow up in England to play in the international series. Bryant, Tony Romo and Jason Witten all received their requisite attention on Tuesday, but Crawford also was surrounded by television cameras and microphones. Crawford grew up playing basketball and didn’t play football until arriving in the United States for high school. He caught the eye of Penn State and earned a scholarship. The Oakland Raiders drafted him in the fifth round in 2012. He was initially planning for a return to London with the Raiders this season, but he was among their final cuts. He signed with the Cowboys four days later. Last week Crawford said he would not feel confident about his return until he got on the plane. And there is no guarantee Crawford will play Sunday. He has missed the last four games with a calf injury. He only returned to practice last week, but felt that by getting through the week he has put himself in position to play. In four games he has three tackles and a sack. With the NFL trying to grow the game in England, Crawford can be offered up as a local kid who made it.